Over packing is an epidemic. The airport is already stressful and lugging more than you need only makes it worse, often delaying your arrival in a new city because the airline has lost your luggage, or the baggage guys are taking a break. Seasoned travelers know the best way to eliminate that extra stress is to pack light, only bringing the essentials in a carry-on that you don’t have to check. Think you can’t do it? You can. We can show you how to, and what to pack in your carry-on to minimize those luggage related travel pains. The first thing you need to do is get in the right mind set. Embody the minimalist inside you. Whether you’re packing for work or pleasure you can make any trip, to any destination with a very small amount of luggage. You don’t need the kitchen sink—really they’ll have a sink where you’re going—and if they don’t, guess what? You can probably live without it for a few weeks. In case you haven’t guessed, the sink in this case is whatever you happen to pack that you know you really don’t need. Ladies maybe that’s the third pair of shoes. Guys it might be every electronic you own. Pair down the liquids people, there’s no reason you need a jumbo size shampoo, seriously. If you’re going to a hotel there’s a good chance they’ll have shampoo among other things at your disposal. Some hotels even go above and beyond offering extras like disposable razors and toothbrushes along with the standard shampoo and conditioner, a helpful perk that can help save valuable space in your toiletries bag. So do some research on your hotel and see what they offer in the way of toiletries when you book and opt to leave those items at home. This one tip will not just save you room it will reduce the chance you’ll have to check luggage because of excess liquids. For products that you must have that your hotel doesn’t supply look for non liquid options. We love stick and powder sunscreens, and single-use wipes for things like moisturizer, make-up remover, and even deodorant! There are a lot of new and creative products out there that can help you get around packing excess liquids and save you space too. We know there’s that fancy moisturizer and designer perfume you just can’t live without—and no one expects you to. For those liquids find yourself some quality reusable, resealable containers and portion them out for the duration of your trip. Check out our favorite leak free containers to find the right one for you. The good news is if you’ve done your research and paired down, everything else should should fit nicely in the TSA required resealable plastic bag. If you’re planing a long trip for more than a week or two consider purchasing full size beauty products when you arrive at your destination. All major cities have drugstores or pharmacies that carry similar products, and if you are going to be somewhere for the better part of a month it’s easier to just pick up what you need on your first day and toss it before you come home, or transfer the unused product to a reusable container on your return. Even smaller cities and towns have grocery stores and drugstores for locals so there’s likely somewhere to purchase what you need. Obviously the first step here is to determine the weather patterns at your destination. Is it dead winter or will there be a heat wave? Second, is the trip business or pleasure? These two points will determine your packing start point—after all, a bathing suit is a lot smaller than a three piece suit. If you know you’re going to be schlepping around a city exploring and sightseeing for 80% of your trip it doesn’t make sense to pack high heels. Instead bring cute sensible shoes that you can wear over long periods of time that won’t leave you limping. If you have an event that requires specific shoes (for a wedding, gala, clubbing, or perhaps all of the above) consider packing one pair of heels that will work with several different outfits and wear your walking shoes on the flight. 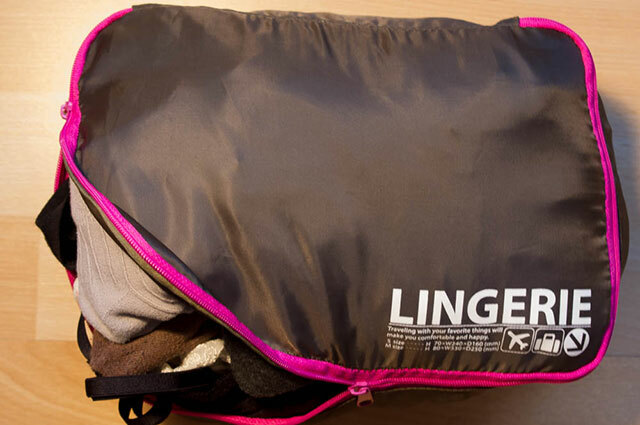 A little thought before hand can save you pounds of weight in your luggage. For the most part if you’re traveling somewhere that’s not the North pole or the Sahara desert you should be able to pack what you wear on a regular bases, so consider the clothes you have in your current rotation. A big mistake a lot of people make is packing those little worn gems they never wear located in the back of their closet. There’s usually a reason why you aren’t wearing those pieces—either they aren’t comfortable, or you don’t feel good in them. Either way don’t pack them. Chances are you won’t wear them and they’ll end up just taking up room in your bag. Think about it, there’s probably only a hand-full of clothes you wear regularly and you wear them because they work for you. Only bring the clothes you look good, and feel good in, that way you can avoid having a ‘I’ve got nothing to wear’ moment. The next and most important tip, is to only pack basics. We know, we know, you want to look exceptional in those vacation pictures, but consider this: basics are the easiest way to look clean, chic, and pulled together. Also there’s no better way to ensure those pictures look great in years to come than avoiding trends that will quickly date your photos. Hammer pants anyone? Another way to edit what you pack is to pick a neutral color palette and stick to it. By picking a color palette and only packing those colors you’ll ensure that all your pieces coordinate with one another easily turning one outfit into three or four. Grey and black, black and white, navy and white, and tan and brown, are all examples of classic palettes that always look great. So you’re thinking basics plus neutral palette equals boring, right? No way, we live for fashion! We just suggest showing your style in a few subdue pieces like a scarf, a belt, a tie, or a beautiful piece of jewelry. After all isn’t it the little things that make you happy in the long run? Try adding one fashion color to your palette like a bright yellow scarf or t-shirt that will instantly add some excitement to your wardrobe. Don’t believe us? Take a look in any fashion magazine and you’ll see several obvious color stories—that’s the way a fashion collection works: a basic neutral palette with a pops of accent colors and accessories. 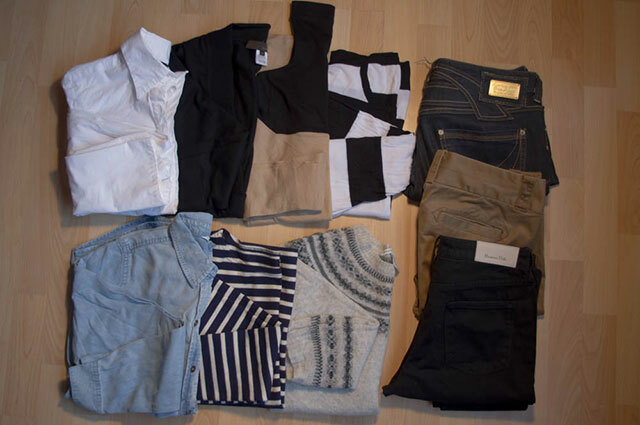 So think of packing like you’re creating a mini fashion collection out of your own clothes. Basic pieces in neutral colors with one or two fashion accent colors and accessories. If you can do this you’ll always look pulled together, on trend, and best of all—you’ll eliminate extra pieces that you really don’t need. Now you have your outline—current rotation pieces, basics in a discernible color palette, and a few great accessories in a fashion color. Now EDIT. Editing is the hardest part of packing and where most people fall short. They set out strong but can’t trim their selection properly. Start by eliminating the most bulky pieces that you don’t feel you’ll wear more than once. Then pick two head to toe looks that you love. Keep them in the same palette and use the same shoe with both looks. Now switch the tops on those outfits, do they work together? If they’re basics in a neutral color they should—and you’ve just created four looks! Now using a few other basic pieces change each of those looks slightly. Layer a jacket or a cardigan on one, or try a belt or a scarf on another, each time you’re multiply your looks. The idea is to create as many looks, with as few pieces as possible. Every time you use a piece in a look give it a mental point, the pieces with the most points at the end get packed the others get left behind. This is the fun part, and the more you do it, the better you get. This concept isn’t just for travel either it can apply to your every day life as well. Consider trying a few of these steps the next time you clean out your closet and you’ll be left with only looks you love and a trim, sleek, minimalist wardrobe. French women have been doing this for years and it certainly works for them. : Request a few extra towels from house keeping. After you wash and rinse your clothes wring out as much water as you can and lay your garment on a flat towel and tightly roll the towel around the item. This will sop up excess water and help to dry the item faster. Unroll it from the towel and hang to dry in an open area, i.e. NOT inside the closet. So you’ve got your outfits and you’ve edited your selection, but you’re still not convinced that it will all fit in your carry-on. 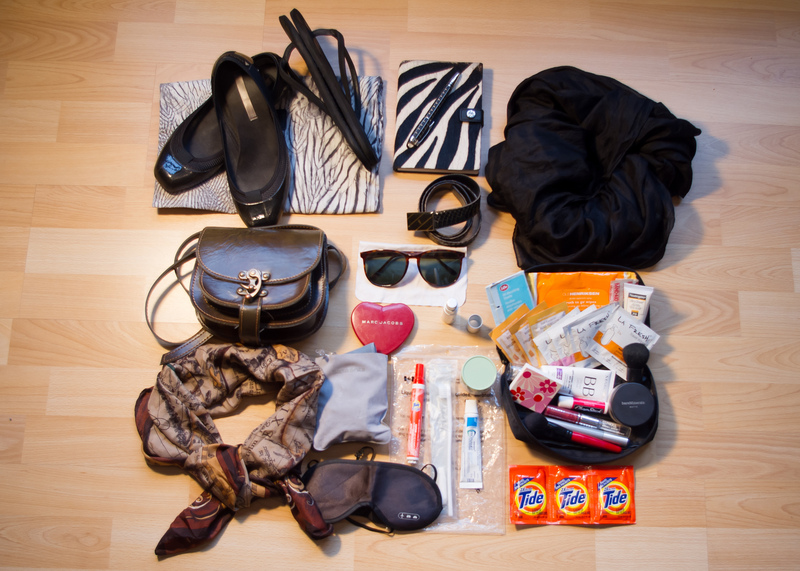 Well we’ve got a few more secrets that can help you neatly fit everything into that tiny bag. First pull out the bulkiest outfit, the one that will take up the most space in your bag, maybe it’s jeans, a heavy knit sweater and a jacket. Make an outfit from those pieces and set that aside as your airport outfit. By wearing the bulkiest pieces you can bring more in your suitcase and still have those coordinating pieces when you arrive for other outfits. Plus, planes are notoriously cold so wearing heavier pieces will keep you warm on your flight. Make sure this outfit is comfortable enough to wear on a plane and that they look pulled together. There’s no reason to look like you just rolled out of bed in sweats, you’re not doing yourself or anyone else any favors by looking a mess. 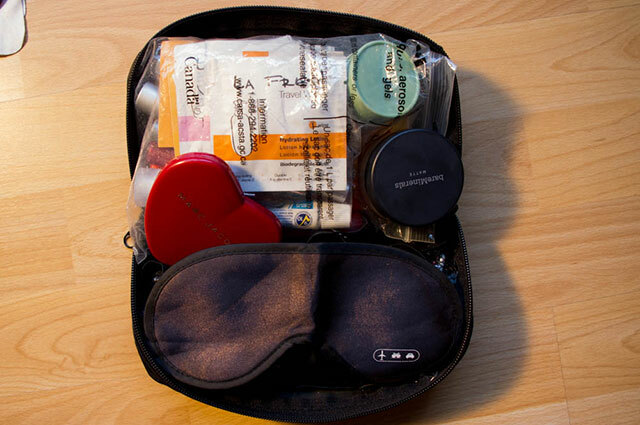 Packing cubes are another secret of seasoned travelers and one of our favorite products. These fabric cubes allow you to fit a lot into a tiny space by compressing and eliminating excess air surrounding your clothing to keep everything tight and organized. Many people use large resealable freezer bags for this, although they are limiting because they only open on one end, where these cubes unzip on three sides allowing you to fit more inside. We like the cubes from Spacepak which are double sided allowing you to separate clean and dirty clothing. 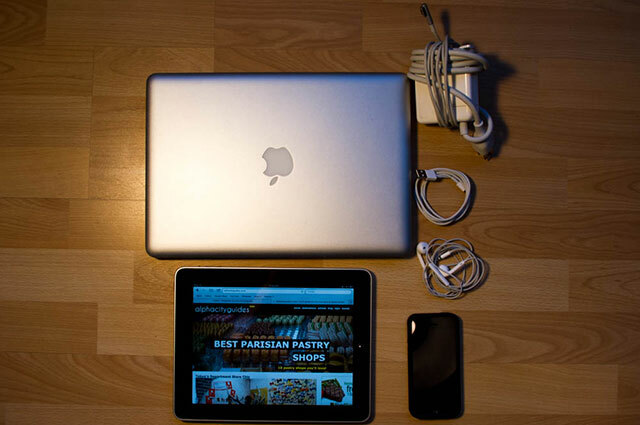 Electronics are important and we don’t expect you to leave those at home. We travel with laptops, phones, and cameras everywhere we go. Since our carry-on suitcase is full of clothes and toiletries we pack all our electronics in our ‘personal item’—this is the piece of carry-on luggage you can take in addition to your carry-on. Your personal item can’t be a second suitcase, it should be a smaller backpack, messenger bag, or tote bag. There’s slight differences in the size each airline will allow as far as personal items go, so it’s important you check that your bag size is acceptable. We like small backpacks because you can often find ones that are made for carrying cameras or laptops with built in padding, and backpacks are easy to carry. If you want to use something you already have just make sure you’ve safely packed your electronics inside with proper casings so nothing gets damaged. For adaptors and cords try the Grid-it system which securely holds a number of different cords, adaptors, headphones, and small electronics like tablets, e-readers, Ipods and small cameras. Don’t forget about that long flight ahead of you, there’s a few things you’ll need to pack to help you get comfortably to your destination. A Flight pillow (we prefer an inflatable one to save space), Earplanes to protect your ears during take off and landing, and an eye mask to help you sleep. These things can be stored in a small pouch along with any other necessities that can be easily access and stored in your seat front pocket. The beauty of not checking luggage means that everything you bring is only an arms reach away in the overhead. Now you know how professional travelers keep it light and organized without sacrificing the essentials—oh yeah, and don’t forget your passport.